Stamps used are “Airborne – Economy Air Fare”, “Treed by?”, “Treed – I See…”, “Shrubs/Clouds”, “Running Fast”, “Fireworks – Pop! Pop!”, “Ready Aim – Fire”, “Large Brownie Rock”, “Fireworks – Should I?”, “Rocks & Ground” and “Really?”. Card by Ann Mumper. Tags: Airborne - Economy Air Fare, Ann Mumper, Brownie - Running Fast, Fireworks - Pop! Pop! Pop!, Fireworks - Should I?, Ready Aim - Smoke, Really?, Scenic - Large Brownie Rock, Scenic - Rocks & Ground, Scenic - Shrubs/Clouds, Treed - I See..., Treed by? 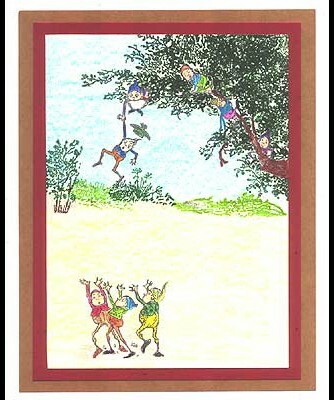 “Treed – I See…”, “Treed – Hold On!” and “Catch It” are stamped in black ink and colored with pencils. “Rocks and Ground”, “Weed Patch” and “Medium Tree” are stamped in shades of green to establish the horizon. A mask of “Treed – I See” is used while “Long Branch” is stamped in dark green to create the leaves on the tree. The sky is colored blue with chalk and the ground is colored yellow and green with chalk. 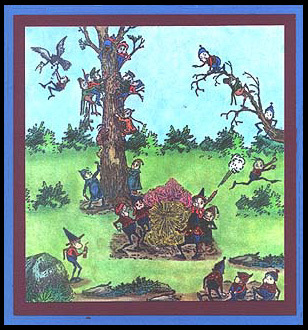 Shadows are colored with brown pencil at the feet of the three brownies on the ground. The card is layered on red confetti, medium brown, and white card stock. Card by Lisa Logsdon.